Select desired storeWALL screw length 1-3/4" 2-1/2"
(5) Boxes of storeWALL Screws: (100 per box) SC62/SC61 color matched 1-3/4 or 2-1/2 inch bugle head screws needed to mount StoreWALL Panels. Select 1-3/4" screws when securing directly to wall studs or other secure building material. Select 2-1/2" screws when securing to studs underneath drywall or other plaster material. Store numerous items off the floor. 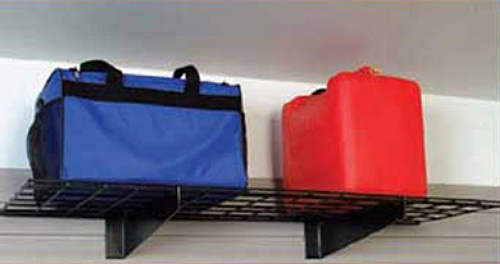 Provides great overhead, perimeter wall storage along the top edge of your wall panel. These four units provide 15 continuous feet of 15 inch deep storage space when placed side by side! Can also be stacked one above the other.